Darjeeling: The Gorkha National Liberation Front, once a predominant hill party that had lost its support base to the Gorkha Janmukti Morcha, has starting an aggressive campaign to spread its wings across the region. Political observers pointed out that during the 104-day strike period, one of the biggest beneficiaries was the GNLF as a large number of Trinamul Congress workers had switched allegiance following threats from suspected Morcha supporters. Even after the strike, the party has carried on with the momentum. Mahendra Chhetri, the general secretary of the GNLF, said on Thursday: "People are liking our ideology and joining us in large numbers. We are not concentrating on big public rallies at the moment but have basically started our goan paso abhiyan (lets go to the villages)." On Friday, the GNLF is scheduled to hold a public meeting at Sukhiapokhri followed by another at Panighatta on Sunday. Cadres have started planting party flags across Darjeeling and have also appointed convener in places like the Singamari-Tukvar area, a Morcha stronghold which had become virtually impenetrable over the last 10 years. "Many of our old leaders are once again coming out in the open," said Chhetri. A former GNLF heavyweight from the Happy Valley tea garden, Kishore Gurung, is set to join the GNLF in Darjeeling on Friday. The party has also decided to form four branch committees after the formation of Kalimpong district. Chhetri said the party's main objective was to achieve a Gorkhaland state, but it also wanted the Sixth Schedule status to be implemented. "There is no doubt that the permanent solution for the hills is Gorkhaland but in present times, we need to safeguard our community, our land, and this can be achieved through Sixth Schedule." 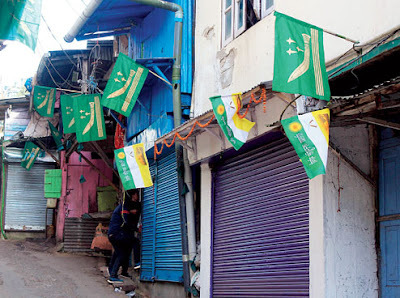 The Gorkha National Liberation Front, once a predominant hill party that had lost its support base to the Gorkha Janmukti Morcha, has starting an aggressive campaign to spread its wings across the region.